E. Annie Proulx won the 1993 PEN/ Faulkner Award for her novel Postcards and a Pulitzer Prize in 1994 for her next novel, The Shipping News. While she was certainly not an overnight sensation, having written stories from the age of ten and published short fiction since her early 20s, E. Annie Proulx did present her own remarkable success story, one characterized by hard work and a fierce independence. The measure of her success was impressive; with her first attempt at long-form fiction, Proulx won the respected PEN/Faulkner Award and the accolades of critics and fellow authors. David Bradley, writing for the New York Times, dubbed Postcards an example of "The Great American Novel." This acclaim snowballed with the publication of The Shipping News, which garnered three major prizes for Proulx and brought comparisons to legendary authors William Faulkner, Theodore Dreiser, and Herman Melville. There was an overwhelmingly positive response to what Sara Rimer, writing for the New York Times, characterized as Proulx's "offbeat, darkly comic voice and vivid sense of place." Proulx was transformed into a novelist after 19 years of work as a free-lance journalist. She wrote articles for magazines on a myriad of topics, of which she offered these examples to Contemporary Authors: "weather, apples, canoeing, mountain lions, mice, cuisine, libraries, African beadwork, cider and lettuces." Her work appeared in publications such as Country Journal, Organic Gardening, and Yankee. In the early 1980s Proulx produced a shelf full of on-assignment "how-to" books on food, gardening, and carpentering, including Sweet & Hard Cider: Making It, Using It, and Enjoying It, The Fine Art of Salad Gardening, and Plan and Make Your Own Fences and Gates, Walkways, Walls and Drives. Another journalistic venture cast Proulx as the founder and editor of a rural newspaper, the Vershire Behind the Times, from 1984 to 1986. The financial rewards for such work were meager; devoting time to writing short stories was a luxury—Proulx averaged two a year, nearly all of which were published. In tiny backwoods towns in Vermont, Proulx indulged her passion for fishing, hunting, and canoeing and lived the self-made, from-scratch lifestyle suggested by her free-lance assignments. She told Washington Post writer David Streitfeld of her love for places "where things are still done with a sort of awkward and almost tiresome physical input that's always so very satisfying. I can do these little chores—getting in my wood or planting in the garden—and feel quite enriched." Proulx also relishes the smallest details in her environment; she told Time's John Skow of her interest in "everything … from tree branches and wild mushrooms to animal tracks.… It's excellent training for the eye. Most of us stagger around deaf and blind." This focus is something instilled in Proulx by her mother, a painter and amateur naturalist. As a child she was taught to observe the activities of ants, whom her mother would give voices, and to notice every particular, the texture of fabrics and the distinctive characteristics in a face. An early chapter in Proulx's life could have led to a very different existence for the author. After receiving her B.A. and M.A. in history, Proulx completed doctoral orals in Renaissance economic history, the Canadian North, and China; but in 1975 she abandoned academia for fear of not finding a teaching job. As she told Contemporary Authors, this was jumping "from the frying pan into the fire, " and left her in "brutally poor circumstances. Compensations were silence and decent fishing, both vanished now." Generally reticent about her private life, Proulx admits that she was, well, "wild" during those years. She told David Streitfeld, "I liked the rough side of things, always." The end of her academic career coincided with the end of her third marriage; as a result, Proulx raised her three sons as a single parent. In 1983 Proulx's career as a fiction writer was boosted by a notice in Best American Short Stories, an honor that was repeated in 1987. Proulx published her first book, Heart Songs and Other Stories, in 1988. This collection introduced the reading public to Annie Proulx's gritty themes and deft, if unconventional, use of language. Against the starkly beautiful backdrop of the New England countryside and in the guise of hunting and fishing stories, Proulx depicts the struggles of men trying to cope with their emotionally and morally tangled lives. Proulx illustrates the stories with vivid verbal pictures, such as a man who eats a fish "as he would a slice of watermelon" or a woman who is as "thin as a folded dollar bill, her hand as narrow and cold as a trout." With the addition of two new stories, a 1995 edition of Heart Songs was released under the same title. Kimberly G. Allen, writing for the Library Journal, suggested that perhaps the subject matter would not interest every reader, but concluded that "the stories flow effortlessly and the prose is elegant." In the New York Times, Kenneth Rosen noted that the stories are "most compelling when they're rooted in a coarse rural sexuality. At these times, their sometimes enigmatic, often lyrical images seem to complement New England's lavish but barren beauty." When Scribner's editor Tom Jenks drew up Proulx's contract for Heart Songs he suggested that they include a novel in the agreement. Positive critical response to the short stories prompted her next editor, John Glusman, to reiterate the idea that she should try her hand at a novel. The resulting work, Postcards, proved to be a liberating experience for Proulx, who had never before considered undertaking such a task. With characteristic fervor she plunged into the assignment; it took her half an hour to form the plan for her first novel. She told the New York Times, "It was astonishing how easy writing a novel was compared to writing a short story. … I had room to expand. It was like getting into a warm bathtub. I haven't been able to write a short story since." In many ways, Postcards resembles the stories found in Heart Songs given a larger scope. The main character is again an emotionally tortured man from New England, but Loyal Blood is cast out into a new world when he flees the family farm after accidentally killing his fiancee. Proulx plotted Blood's cross-country wanderings with her own trip across America doing research. David Bradley of the New York Times described the resulting book as "episodic and picaresque, a 'Huckleberry Finn' without the laughter, 'The Grapes of Wrath, ' without the hope." Postcards Postcards is as much a novel about the land, however, as it is about a man. From a description of the Vermont farm, likening it to the opened pages of a Bible, to a Florida sky marked by "a fan of clouds like crimson knife blades, " Proulx luxuriates in her freedom to sharply define the various settings in the sweeping tale. "It was astonishing how easy writing a novel was compared to writing a short story.… It was like getting into a warm bathtub. I haven't been able to write a short story since." Postcards was undoubtedly a professional and personal success; it proved Proulx's skill and comfort working in the new form. The most tangible evidence of her achievement was receiving the 1993 PEN/Faulkner Award for fiction and its $15, 000 bonus. Proulx also enjoyed the distinction of being the first woman to be so honored; the resulting New York Times headline read: "Shutout Ends: It's Men 12, Women 1." The accompanying article noted: "Ms. Proulx's novel was widely praised by critics for the vastness of its physical landscape and the intimacy of its language." The very next year, Proulx capped this success by writing The Shipping News. This novel is a dark but comic tale set in Newfoundland, the story of a luckless newspaper reporter named Quoyle. It is packed with details of the island's landscape, weather, food, and language, all drawn in a choppy yet vibrant style. An oft-quoted passage describing the protagonist illustrates this method: "A great damp loaf of a body. At six he weighed eighty pounds. At sixteen he was buried under a casement of flesh. Head shaped like a crenshaw, no neck, reddish hair ruched back. Features as bunched as kissed fingertips." The book resulted in a steady stream of awards: first, the Heartland Prize from the Chicago Tribune, followed by the Irish Times International Award and the National Book Award. These honors were all topped by the 1994 Pulitzer Prize for Fiction. In the media, the response was almost unanimously positive, even doting. An exception was a review by Verlyn Klinkenborg. Writing for the New Republic, she viewed these awards with a cynical eye: "The Shipping News is an out-and-out crowd-pleaser, a book that will certainly not diminish the commercial value of the National Book Award even as that award (and the Pulitzer Prize) increases this book's sales." Klinkenborg suspected that under the "powerfully descriptive" writing there was a dramatic and emotional vacuum. More often, however, the novel was heaped with praise; in the Yale Review, Walter Kendrick remarked, "The Shipping News reverberates with voices, each possessing a distinctive twang that Proulx exuberantly sings along with. … She loves dense, chewy presumably local words: stribbled, streeling, skreel, marl, scrawn, thunge, drenty, glutch. … People, landscape, and language fit together like rocks in an unhewn wall, forming a marvelous composite portrait of North America's last margin." In New Statesman & Society Roz Kaveney noted how, with the book's improbable twists of plot, "Proulx's triumph is that she makes us swallow all of this. Her work not only describes, but is imbued with, a chancy decency that looks us forthright in the eye and challenges disbelief. This is an artful novel." The Shipping News was the result of a canoeing trip to Newfoundland, followed by careful research. After falling in love with the place, the author took at least seven trips to the island, talking to residents and absorbing the atmosphere. She pulled her characters' names from telephone directories and words from the Dictionary of Newfoundland English. Here the journalist and historian in Proulx surfaced, both in her interest in seemingly arcane details, and in her passion for "getting it right." In researching her next novel, Proulx became an expert on accordion music. She studied not how to play the instrument, but how to take one apart and then reconstruct it. Various magazine articles reveal that Accordion Crimes is about the music of immigrants and specifically about different kinds of accordion music. The author described the work in the Rhode Islander as "stories of immigrant lives and music on both borders—la frontera and la frontiere." In this there is a hint of autobiographical interest: Proulx's father's family came to the United States from Quebec. In the wake of her fame, Proulx was hard-pressed to find the time she needed to research and write. In 1994 she managed to publish short stories in Atlantic Monthly and Esquire. On top of her schedule of book signings and readings, she was inundated with requests for interviews, many of which took place in her remote Vermont home. The resulting articles are sprinkled with her comment that the house is for sale. Proulx soon bought a second place in Newfoundland, and by the spring of 1995 had moved to Wyoming. After a visit to Arizona State University that April, the Arizona Republic sported the headline: "Pulitzer-winning author shuns spotlight to write" and found Proulx "prickly and bored, a master of the withering look and stony reply." The Phoenix Gazette offered: "Proulx … is not a people person. A reluctant celebrity after the publication of her second novel, she has developed a heat shield against the scorching intrusions into her private life that come with fame." The media also revealed that Hollywood has been courting Proulx with offers to turn The Shipping News into a movie. The author dismissed this topic, as she has the filmmakers' offers; what interested her most was completing Accordion Crimes, which was released in 1996, and pressing on with other writing projects. Almost a year earlier, Proulx had told Sara Rimer of the New York Times, "I have at the moment three novels sitting in my head, waiting to get on paper, and I know exactly how each one is going to go." She was faced with the "Catch-22" of her celebrity status: having the financial security to become a full-time fiction writer, and yet being overwhelmed by the so-called duties of celebrity. 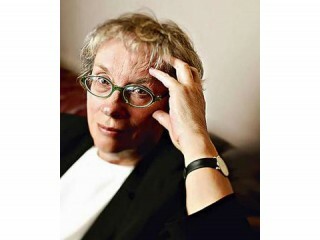 If the past is any indication, however, the author's demand for privacy and independence will prevail and the reading public can look forward to many more novels from E. Annie Proulx.